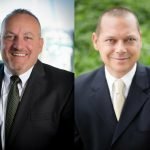 MacKenzie Contracting Company, LLC is pleased to announce the recent promotions of Joe Versey to Senior Vice President and Kurt Mischke to Senior Project Manager. The promotions were announced as the award-winning firm approaches its 30th anniversary. Mischke joined the firm in 2007 in the role of Project Superintendent and was promoted to Project Manager in 2012. Over the past year, Kurt has completed several challenging projects while remaining one of the top three earning project managers in the company for the past two years running. His client list, which includes Under Armour, Howard County General Hospital, Bay Bank, and Liberty Property Trust, continues to grow with numerous repeat clients, a true reflection of his efforts. Responsibilities as a Senior Project Manager will include preparing conceptual and competitive bid estimates; contract and bid negotiations; monthly budget reviews; subcontractor scheduling updates; coordination with the project superintendents; and, quality control from the start of the project through move-in. For more information on MacKenzie Contracting Company, LLC, please visit www.mackenziecommercial.com or contact Joe Versey at 443.610.7505 or jversey@mackenziecontracting.com.